In Italian, the bulb is commonly called “testa d’aglio” (garlic’s head). Any further comments on any pages? Ici 30 représente la valeur 30 que possède cette Lettre. B:puis figure le petit homme ,tenant dans sa main 4 feuilles vertes avec 12 pointes des extrémités de feuilles. Soit l’idée de la 12 LETTRE des 22 que comporte l’alphabet Hébreu. La LETTRE de la TORAH……LAMED à pour sens ÉLÉVATION!!!!! Vers le Haut!!!!! C:voici une Lecture CLAIRE de la première ligne de ce texte éducatif de cet enseignement Hébraïque. Ce n’est pas un herbier! 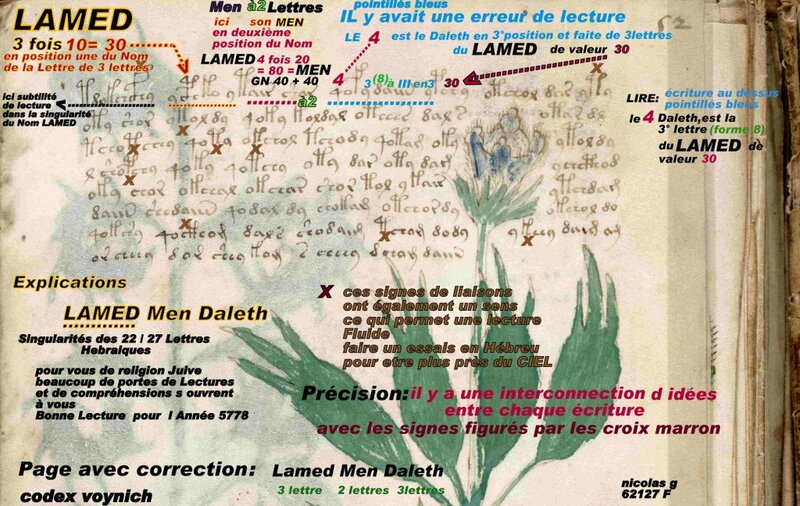 Ces graphismes de plantes, sont les représentations exactes des 22 LETTRES HÉBRAÏQUES…. point final!… n’en déplaise à Mr Bax et Mr Gibbs! Voici la page 52 du codex…. Elle représente les Singularités NUMÉRIQUES de la douzième LETTRE des vingt deux LETTRES de L’ALPHABET HÉBREU. ICI page 52.on parle de la LETTRE de NOM…LAMED….la douzième des 22 LETTRES. I am interested in reproducing manuscripts and in my efforts I met with the intriguing Voynich manuscripts and therefore I came to this page. I would like to know if someone was able to translate the text of the Italian Herbal to try to reproduce it with my writing. In most cases, the texts in the two herbals are almost identical. Those manuscripts are a revelation. Thanks for posting the links. Here are some links to Turkish/Ottoman and Persian illustrated herbal manuscripts – only single pages I’m afraid. Does anyone know why there are so few? Have they all been destroyed (why? ), or are they still mostly in private ownership? Do you know of any others? Please upload URL if you know of any online Digital copies. Its a pity only a single photo of the Ottoman Herbal treatise is shown. Again, if anyone knows any more about it, please post . I am surprised at the idea that there are only two Arabic herbals – that is simply not true, and I’ll start posting links to some of the ones I know. I wonder what Minta Collins meant? The plant on page 70 is almost certainly ramson (Allium ursinum). I am also italian and have translated the text. First words are probably “(A)Glio horsis” (the initial A is missing) and the picture matches exactly the plant itself. Except for the faces, apparently there are no resemblances with the one depicted on the VM. thank you for the new herbal page! “Teneilla[?] la foglia di questa erba vale alla ferita morsa[morta?] e posta posta[twice?] sopra alla ferita sembra[?] meraviglia falla saldare[?] in quatro hora. Nasce in montagna petrosa e asptra. Fa il fiore rosso”. “Tenella[? ]: the leaf of this grass is helpful for bite [or gangrenous?] wounds. Placed on the wound, it works[?] marvels and makes it heal[?] in four hours. It grows on stony and harsh mountains. It makes red flowers”. Also in this case, the name of the plant clearly is the first word of the paragraph. I think it could read “teneilla”, possibly meaning “tenella” (Latin for “tender”). “Anagallis tenella” makes reddish (actually pink) flowers, but the shape of the leaves seems different from the manuscript illustration. Thanks very much. It is useful to have an Italian speaker with good eyesight on the case! Have you seen the other interesting Italian manuscript I mention? I particularly like the female mandrake. Thanks also for your note about ‘the first word of the page’. I aim to look more closely at this element of these manuscripts. Yes Stephen, I have seen that other great manuscript. Many illustrations such as the mandrake you mention are not naturalistic at all and very fascinating. It seems that a few plants in this herbal are called “lucia”. At f67v (p.138) four reasons for this name are given. I can only read the second: “reluce la nocte come stella” ([this plant] shines in the night like a star). 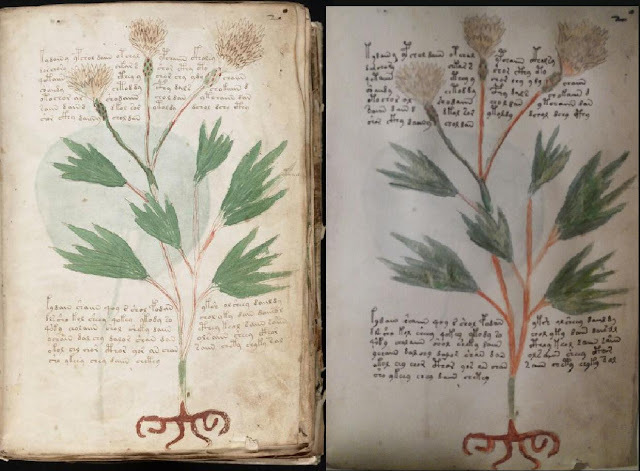 I thought that a possible connection between the herbal and astrological sections of the Voynich ms could be the influence of the Moon on the growth of plants. For instance, the plant on pg. 157 is labeled “lucia da la nova lunna” (“lucia of the new moon”). The description of the Garlic(?) illustration we already discussed (Vermont p.70) ends with the sentence “a di 15 della luna di magio fa il fiore” (it flowers on the 15th day of the moon of May). I wonder if there are other manuscripts that include both a herbal and an astrological section.